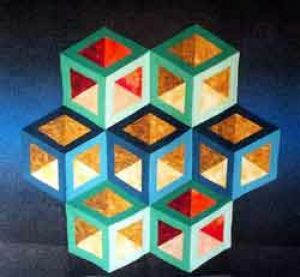 I love creating quilts with illusions and this quilt is my favorite illusions! I wanted to create a quilt with the look of empty boxes, however I wanted the boxes to glow. To achieve this look, I used warm colors as the inner portion of the cube and cool colors to form a frame around the box. The result is a quilt that looks real! I just love the "glowing" boxes.